This year’s college basketball season has been filled with awesome halfcourt shots, from Jay Williams’ multiple daggers to fans walking away with much larger bank accounts. 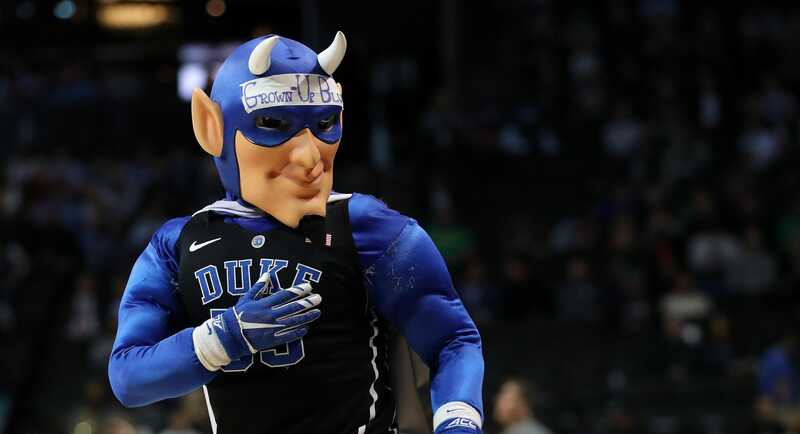 That tradition continued Saturday when ESPN’s College GameDay was in Durham, North Carolina for the UNC-Duke matchup. Duke senior Jack Simon stepped up to halfcourt for Saturday’s fan shot at $18,000 if he could sink the long-range shot in 18 seconds or less. Well, he only needed five seconds and two shots to become 18 grand richer. Simon celebrated with the Cameron Crazies and rapper 2 Chainz, who was at the broadcast and missed two of his own halfcourt shots. After the made shot, ESPN’s Rece Davis revived a favorite recent joke of his, poking fun at the NCAA recruiting scandal, along with Jay Bilas. Davis: Jack Simon winning $18,000! As I always point out, no investigation necessary. Bilas: Isn’t that great? A student can make 18 grand, but if a player makes it, it’s a federal crime. Here are some other amazing and ridiculous highlights from Saturday’s GameDay broadcast, including Marty Smith ditching his mic and crowd surfing.